We value what you have to say, which is why we ask you! These independent reviews are created by customers like you, so you can see what others have tried and swear by. Who said you couldn't have delicious pastries and democratic principles all in one spot? 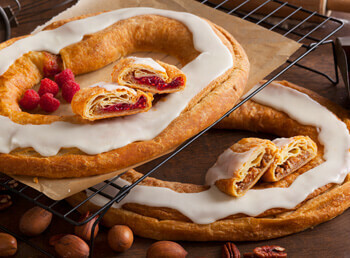 Pecan and Raspberry Pair — $42.99 For four generations we have made our traditional Danish Kringle with the time honored techniques from Old Denmark. This three-day process makes the pastry incredibly flaky and perfect pastry for our scratch-made fillings. Our Pecan Kringle is chock-full of fancy pecans, brown sugar and cinnamon, while our Raspberry Kringle has sweet ruby red raspberries blended to perfection. Some things just go perfectly together and that can be said of these two Kringle. Our most popular flavors and best sellers! Gluten-Free Cranberry Almond/Apricot Coffee Cakes — $25.99 We believe everyone should be able to enjoy bakery which is why we created two gluten free coffee cakes. 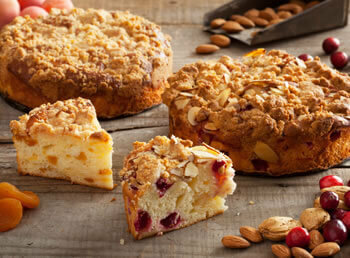 The Cranberry Almond Coffee Cake is moist, delicious and very tender. This is a lovely, rich sour cream coffee cake that highlights cranberry and a hint of almond. The Apricot Streusel Coffee Cake is pleasing anytime of the day. One bite and you will not believe these are gluten free. To ensure gluten-free integrity this product is made for us by a purely gluten free bakery. 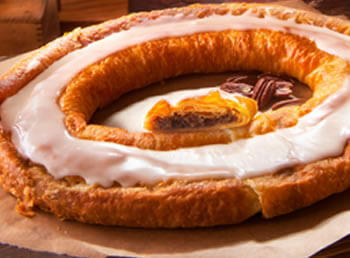 Pecan Kringle — $21.49 Our Pecan Kringle is the heart of our authentic Danish Kringle. It is our most popular flavor and has been a favorite for over 60 years. Chock-full of fancy pecans, blended with a smooth brown sugar and cinnamon filling. You will be hooked after the first bite. 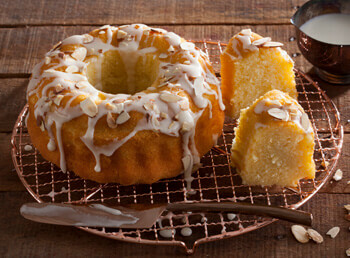 Scandinavian Almond Crown Cake — $22.99 A classic Scandinavian treat is a moist, densely packed almond cake. This distinctive almond flavor appeals to all. Made with intense almond flavoring, as in marzipan, we have created another Crown Cake that is the heart of any Scandinavian home. It's delicious served with whipped cream, fresh fruit and coffee. 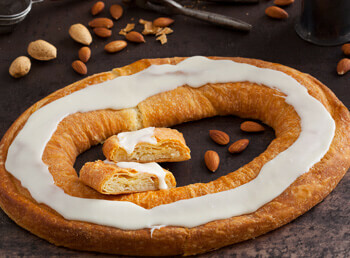 Almond Kringle — $21.49 Our traditional Danish Almond Kringle is one of our best-loved pastries. The exceptionally flavorful and smooth taste make this a favorite since our grandparents started making these special Danish treats over 60 years ago. 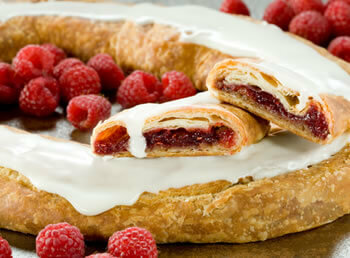 Raspberry Kringle — $21.49 One of our most popular flavors, Raspberry Kringle is a favorite of many. Sweet ruby, red raspberries are picked fresh and then blended into perfection. We know you will love it! 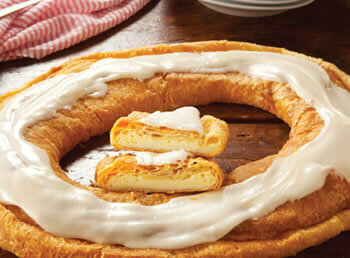 Cream Cheese Kringle — $21.49 Our rich, silky smooth Cream Cheese Kringle becomes more and more popular every year. It probably has to do with the fact that this uses only the best 100% Wisconsin Cream Cheese as the main ingredient. Pour some coffee, pull up a chair, and enjoy this classic Wisconsin treat. 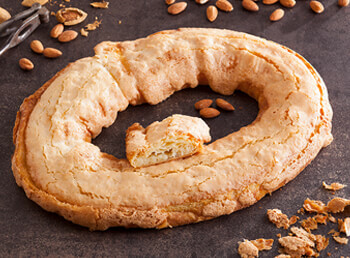 Almond Macaron Kringle — $21.49 Our Almond Macaron Kringle features our traditional Danish almond paste filling. We complete the creation with a light almond batter which complements the flavor before baking to create a fine shell with a crunchy almond topping. 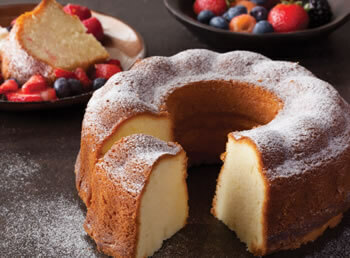 Copenhagen Crown Cake — $22.99 Vanilla and cream cheese are the special ingredients in our Copenhagen Crown Cake. Slice it thin or thick and serve fresh fruit or simply savor its flavor and enjoy. 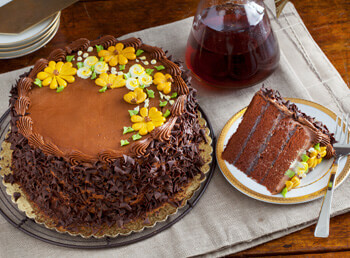 King's Chocolate Layer Cake — $69.99 Truly a Regal cake! Our rich cake layers made with Dutch cocoa and buttermilk, then filled with dark chocolate silk and frosted with a creamy chocolate buttercream. It's adorned with crisp chocolate curls and imported Swedish chocolate. Long Live the King!